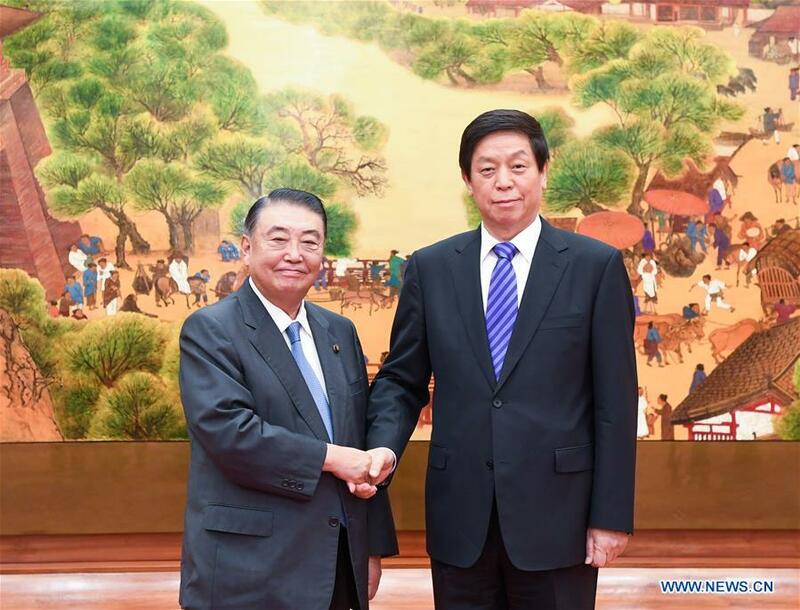 BEIJING, July 25 (Xinhua) -- China's top legislator Li Zhanshu on Tuesday held talks with Tadamori Oshima, speaker of the House of Representatives of the Japanese parliament, urging both sides to keep bilateral relations on the right track of peace, friendship and cooperation. Li, chairman of the Standing Committee of the National People's Congress (NPC), said this year marks the 40th anniversary of the signing of China-Japan Treaty of Peace and Friendship. He said leaders of the two sides have reached important consensus on promoting the improvement and development of China-Japan relations following the spirit of the China-Japan Treaty of Peace and Friendship as well as the principles of the four political documents signed between the two countries. "With the joint efforts of all parties in the two countries, China-Japan relations have returned to the normal development track," he said, calling on both sides to cherish the cause of peace and friendship initiated by the older generation of politicians and promote the stable and long-term development of China-Japan relations, he said. He said the two sides should solidly advance the improvement of bilateral ties in accordance with the consensus reached by both leaders and keep their ties on the right track of peace, friendship and cooperation. "Both sides should abide by and implement the four political documents including the China-Japan Treaty of Peace and Friendship, draw lessons from history and face up to the future, to ensure the healthy development of Sino-Japanese relations and prevent disturbances in and deterioration of the relationship," he said. He said China and Japan should regard each other's development as a greater opportunity, deepen pragmatic cooperation and provide a solid foundation for the strategic and mutually beneficial relations between the two sides. Li said this year marks the 40th anniversary of China's reform and opening up. "China has rolled out a series of specific measures to expand its opening up," he said, calling on Japan to seize the opportunity of China's new round of opening up. Li also called on China and Japan to strengthen cooperation in international affairs, jointly safeguard economic globalization and trade liberalization, and promote the development of the global governance system towards a more fair and reasonable direction. "The NPC is willing to enhance cooperation with the Japanese parliament in the areas of legislation, law enforcement supervision as well as policy communication and coordination," he said, suggesting both sides exchange experience on state-governance to provide legal and institutional guarantees for Sino-Japanese friendly cooperation. He also called on the two sides to boost local cooperation and promote non-governmental friendship in a bid to consolidate public support for bilateral ties. Oshima said Japan and China should "create a new situation in their relations on the basis of remembering history." He said strengthening mutually beneficial cooperation with China was the consensus of all circles in Japan. "The Japanese parliament is willing to strengthen exchanges with the NPC, conduct candid dialog, promote mutual understanding among the two peoples and push forward pragmatic cooperation in various fields, so as to make new contributions to the development of Japan-China relations," Oshima said.